The scene-stealers from the Despicable Me movies have received their own movie, and it’s a prequel! The minions are continually in search for a proper master that they can work for which ends up being a harder task than they had envisioned. Centuries pass taking them from dinosaurs to world leaders, but none of them work out. Without a master, they feel like they have no purpose. After spending time in frozen tundra, Bob, Stuart, and Kevin (all voiced by director Pierre Coffin) brave the world again searching for their new master. While in the New York City, they see an ad on TV for Villain Con down in Orlando that boasts the appearance of the evil Scarlet Overkill (Bullock). Their road trip to the convention proves to be successful when they win Scarlet’s challenge and become her new henchmen. She gives them the ultimate task of stealing the crown of Queen Elizabeth (Saunders). Without knowing it, Bob ends up becoming the King of England knocking Elizabeth off the thrown. This only deepens the rage of Scarlet Overkill who feels the minions have now turned on her as she was hoping to take over the world by becoming the queen. 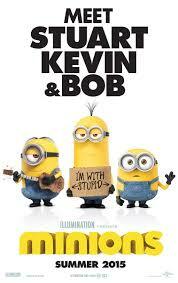 This is the third movie in the Despicable Me franchise from Illumination Entertainment. Fans of those movies will obviously remember these little guys. It is by no means a new concept for a successful animated film to have a fun supporting character get their own spin-off movie. Penguins of Madagascar and TinkerBell are just a few others that come to mind. These can be easy cash cows for the studios to capitalize on a likeable movie character. Minions will certainly bring in a big audience, and it’s easy to understand why. I have to admit, I only saw the first Despicable Me once and have not seen the second one yet. I do not have kids yet, so I have not grown tired of these rascally characters. The minions speak in a high-pitched tone of gibberish with a mix of languages thrown in. They are silly, goofy, and quite funny in their demeanor, especially when they are getting themselves into trouble without realizing it. You can only pick up a few words here or there, so in a weird way, they remind me of the golden era of physical comedians who were always getting themselves into trouble. So much of the humor of the film relies on this idea with the gags and situations they find themselves in. There is a road trip type element to the story with the minions encountering some interesting people along the way. Allison Janney and Michael Keaton are the parents of a bank robbing family that the minions just happen to meet when they start their journey. That’s what happens when you hitchhike! A station wagon comes along with a cute family and low and behold, they are not the pristine image they appear to be. Janney and Keaton are both great voice over actors, but I wish they could have been a bigger part of the movie. It feels a bit wasted to cast these two in such small parts. The majority of the story takes place in England with Sandra Bullock as Scarlet Overkill, Jon Hamm as her husband Herb, and the fabulous Jennifer Saunders as Queen Elizabeth. This is the first time Sandra Bullock has played a villain, but the second animated film for her after 1998’s The Prince of Egypt. She’s at her best when she really lets herself go and has fun with the character, which comes later on in the movie. I have always loved her, but she seems to be playing it a bit safe. I really wanted her to be this over-the-top, lavish comic book style villain, but it takes her a while to get there. You can tell that Jon Hamm is a having a ball as Herb. It’s a far cry from his Don Draper days on “Mad Men”. He’s a riot at playing her relaxed, “far out” style husband. Minions is short and entertaining, which will appeal to families. It’s by no means dumbed down, but also doesn’t have any sort of deep meaning or message behind it. It’s an easy and safe good time if parents are looking to get their kids out of the house. The younger ones will probably enjoy it more than their parents, but it’s not completely lacking in adult gems. It takes place in 1968 leading to some fun music and references from The Beatles to The Monkees. The minions are cute, adorable, and will make you laugh, but you will probably forget about their movie shortly after seeing it. Is It Worth Your Trip to the Movies? Very middle of the road when it comes to animated movies. It’s not great, but it’s certainly more entertaining than others.